I reported my assault to NYPD. Like Jussie Smollett, I was arrested. His case is harmful. I reported my assault to NYPD. Like Jussie Smollett, I was arrested. His case is harmful to the survivor community. 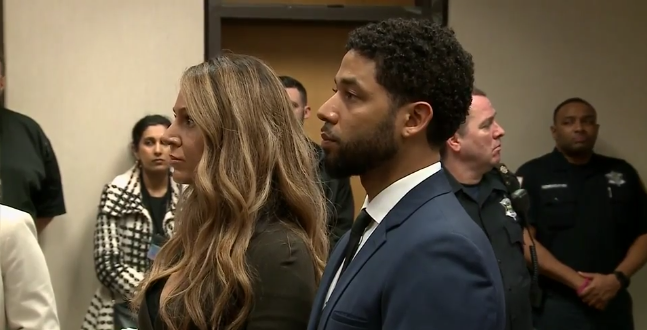 Empire actor Jussie Smollett was arraigned, after being indicted on March 7 for allegedly staging a violent hate crime against himself. As of today, March 14, he pleaded not guilty to 16 felony counts for falsely reporting an assault to Chicago police. I am a woman of color, who’s been an assault victim, and had the police turn on me after reporting. In light of everything, I’m sharing my story and how this case affects me, and the survivor community, at a profound level. It had been less than a month since the attack. I was startled by his opening question. I had a trove of evidence — injury pictures, doctor’s notes, x-ray results, open case files with both Manhattan Family Justice Center and Safe Horizon, therapy referrals, and more. Initially, I could not understand why the detective did not seem to believe me. Watching the tangles of the Jussie Smollett case come apart, I understand now. Regardless of the detective’s perceived distrust in me, the case moved forward to NY Criminal Court. The charges brought were felonious, due to use of a deadly weapon. After my abuser was arrested, he filed a false police report in retaliation against me. There was enough available “evidence” to frame me and establish probable cause for felony charges as well — charges unrelated to the accuracy of my initial report. I witnessed firsthand how quickly the tides could turn. Like Jussie Smollett, I went from victim to wanted suspect. Like Jussie, the police came after me. Like Jussie, I was arrested. Threats of an arrest and search warrant elicit terror so unique, it can only be understood by those who’ve found themselves in similar positions. “You Can’t Run, You Can’t Hide” suddenly becomes the 24 hour anthem of your life. The most you can do is prepare, cope with the trauma, wait, and hope for the best. On April 25, 2018, I turned myself in to the 7th Precinct in Lower East Side of Manhattan. I was made to do the “perp walk” in handcuffs, while my arms and ribs were still purple and tender to the touch. The seemingly key difference is — I told the truth and stuck by it. My account never wavered and my integrity remained intact. Wary of jumping to conclusions, I’m unsure if the same could be said of Jussie. If it turns out Jussie told the truth, I empathize deeply with him. And the public will have to reckon with how he’s been vilified. The point is — nothing is ever black or white. It’s important to emphasize nuance in these sorts of situations. Unlike Jussie, my abuser never faced the consequences of falsifying a report. Prosecutors dropped the charges against me, but were unable to add the faked complaint as an additional charge to the pending criminal case. My experience showed me just how often people get away with lying. This is what the police understand and see far too often, that I was unable to understand before. Although I do not agree with the aggressively dubious approach taken in my case, I now understand to a degree the difficulty discerning right from wrong in a world of facts and lies. My story is nothing new. Time and time again we see similar situations arise with the Cyntoia Browns (extreme comparison) and Marissa Alexanders of the world. I was just privileged enough to be able to hire private, legal representation. Seeing Jussie’s story unfold has been a surreal experience. Never mind the fact that his name so closely resembles mine. It has been incredibly triggering, and often I cannot bear to look at social media, for fear of coming across his name and experiencing unwanted flashbacks of memories that feel just as vivid as the day they occurred. PTSD is a beast of a disorder to be reckoned with. It is important to recognize how psychologically vulnerable many in the survivor community feel right now, as we are unable to escape the media onslaught regarding cases like Jussie’s (e.g. Leaving Neverland, R. Kelly’s case). For many of us, mental well-being is a rare luxury. Make no mistake, the police still have a lot to be held accountable for. Police misconduct against minority groups remains an issue in America, especially in groups like the African American and LGBTQ communities. Know that my intention is not to “draw away,” in any sense, from the very real conversations taking place around such communities. What I am trying to provide is a relevant point-of-view. I write this piece as a plea to the public: please do not let one alleged bad actor taint your attitude and view of assault survivors of all kinds. There are a lot of us out there, and lots of us wish to be heard. What Jussie Smollett did, if he did it, has tangible negative effects. If he gets convicted for staging his attack and lying to authorities about it, there will be measurable ill effects to the survivor community. He doesn’t even know me, but Jussie’s alleged wrongdoings have hurt me, personally. And I’m sure they’ve hurt many other survivors as well. Again, this is if he lied. In any case, the Chicago PD, prosecutors, and media have already painted a picture of this case that demands addressing. As a survivor of both violence and The System, my ask for you is this: please still listen and believe. Most of us are still searching for a voice. Like my case, we are often re-victimized by the public and those who are supposed to protect us. Despite the risks, we want to be heard. Follow Jessie on Twitter or email her at hitherejessie@gmail.com. In 2018, NYPD brought felony charges against me, after I’d come forward as an assault victim. I’m a survivor of both domestic violence and the NYC criminal justice system. This is my story.